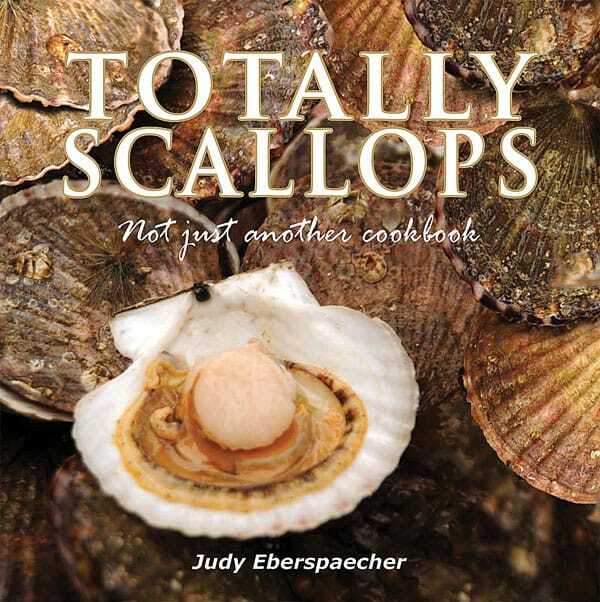 "I ate scallops before I ate Pablum," claims Judy Eberspaecher, author of the new Totally Scallops: Not Just Another Cookbook. When she was a child, fish pedlars delivered to her mother's door in New Ross, NS, twice a week. "What have you got today?" Judy's mother would call. The pedlar would rhyme off the catches of the day: "Tongues and cheeks! Scallops! Fresh mackerel!" When it was scallops, Judy's mother prepared them the same way each time. "Mom used to roll them in flour and sauté them in butter." Judy and her three siblings would eat about six apiece. "That was the only way I ever ate them, unless of course you went to the Exhibition and got them deep-fried." She says, "This book is for people who want to go beyond that." It was as an exiled Atlantic Canadian that Judy first got the idea for this book. She had left Nova Scotia in the '60s to work as an elementary school teacher in Ontario. A friend, Gerry Rice, used to visit her often from Nova Scotia, bringing 100 lbs (45 kg) of frozen Digby scallops at a time for Judy and her friends. Favourite recipes circulated among the friends for years. Judy collected them, vowing to turn them into a book one day. After she retired from teaching, she joined her husband Alex as a photographer on his travel writing trips. Everywhere she went-Tunisia, Japan, Israel, Brazil, Norway, Australia, New Orleans and back again to Atlantic Canada-she sampled scallops and added to the recipes she'd been collecting since those memorable childhood meals. "In the back of my mind, I knew I always wanted to do something with them," she says. In the book's introduction, she writes, "After seeing those bits of paper in my cupboard for over 20 years, I was on the verge of throwing them out when I told my husband Alex what my intentions had been. From that point onward, he would not let the idea die." In researching the subject, Judy came to realize how little she knew about scallops and the scallop fishery. So when the Bedford Institute of Oceanography and O'Neil Fisheries of Digby offered a scallop fishing trip aboard the Royal Fundy on the Bay of Fundy, she jumped at the chance. "I have a new respect for fishermen," she says. The crew showed her how to handle the fishing and navigation equipment. "They were so good to me," she says. "Very patient and never laughed at me or made fun of me when I screwed up." Back in Digby, Judy looked around for the best places to eat scallops. She found it difficult to find them prepared in any but the most traditional ways. However, over at the Digby Pines Resort Judy found chef Claude AuCoin working his magic. 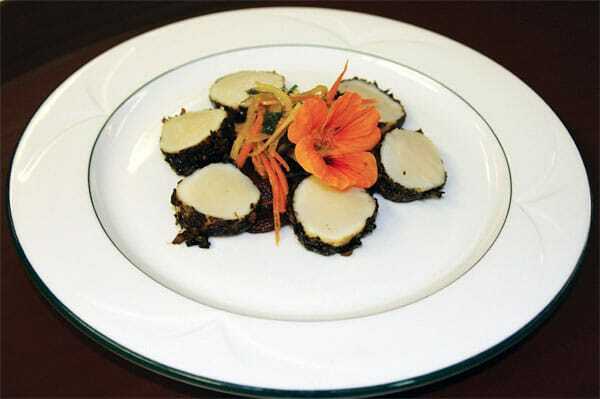 He wrapped scallops in nori sheets (the dried seaweed used to make sushi) and coated them in crumbled dulse, a locally harvested seaweed. Her book presents this and another 100 or so recipes from six continents featuring dozens of scallop varieties, placing Eastern Canada firmly in world-class company. As the subtitle suggests, the book is more than just a cookbook. It's also packed with interesting facts about scallops and the places they're fished and eaten, as well as the fishermen, fishmongers, chefs and home cooks who love them. For example, chef Theo Randall at the InterContinental in London, UK, offers this scallop advice: "Treat them like miniature tenderloins. They have such a great texture and flavour that they don't need much help." The book is dedicated to her friend, Gerry Rice, who has since passed away. It's handsomely illustrated with photographs, many of which are Judy's own. Her husband, Alex, provides an inspiring survey of the wines that best complement scallops plus a quick look at harvesting and farming methods around the world. Totally Scallops is published by Kimagic, 2009.